Happy Pongal to every Tamilian. But yeah, are we happy? Some random international organization has banned one of the oldest sports which has its roots in Tamil culture. Let me present my opinion on this Jallikattu issue. There are many facts to be considered from a widespread angle. We are your MITRONS, too. December 2016. For one month, the entire city was ravaged by rains. Appreciate the fact that people stood united and helped each other, as that was the only source of help to us! We Tamilians, especially Chennaites have been proving repeatedly that we can come back from whatever problem we have, provided we stand united. Ask the national media people to broadcast the comical politics that’s been going on in the North, they’ll accept the offer, with glee in their faces. These people want eye catching headlines. But, the issues we face would attract more eyes than the taxing political debates and barrage of lies we witness daily. You’re wondering about what that ‘it’ refers to, right? It refers to bull fighting, a famous sport in Spain. It is the Spanish version of Jallikattu. This is what Wikipedia says about the sport. Note the words “highly ritualized” and “deeply tied”. 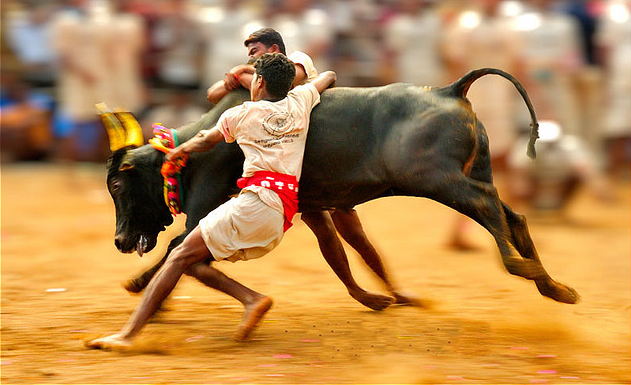 We Tamils revere our sport even more highly and also the bull which takes part in it. But, bullfighting isn’t banned. It isn’t criticized either. One word for this. DOUBLE STANDARDS. Well played, PETA. This is a kind request I put forth to all my friends and to the good soul who hasn’t been bored of my post and is still reading it. People have their own opinions. We have to respect it. A person who’s against Jallikattu doesn’t have to be bashed. Stop spamming public posts with pleas for the sport to be held. I was surfing on Facebook and I saw that our Prime Minister had posted about having breakfast with his mother. In the comments section, you can see hashtags like #FreeTamilNaduFromIndia #IndependentTN. Please do not resort to such insensitiveness and make a fool of yourself. And stop abusing celebrities on their walls. You know who I’m referring to. We all remember how a section of our beloved Karnataka people behaved for the Kaveri issue, right? ( No racism intended ) Now’s our time to prove that we are more mature. So let us be sensible and responsible human beings. Thank you! ← Is Tech Hacking Us?